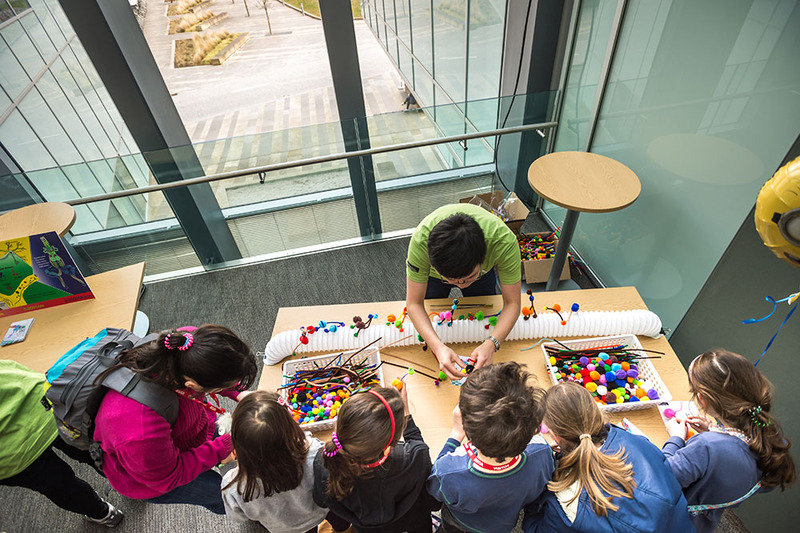 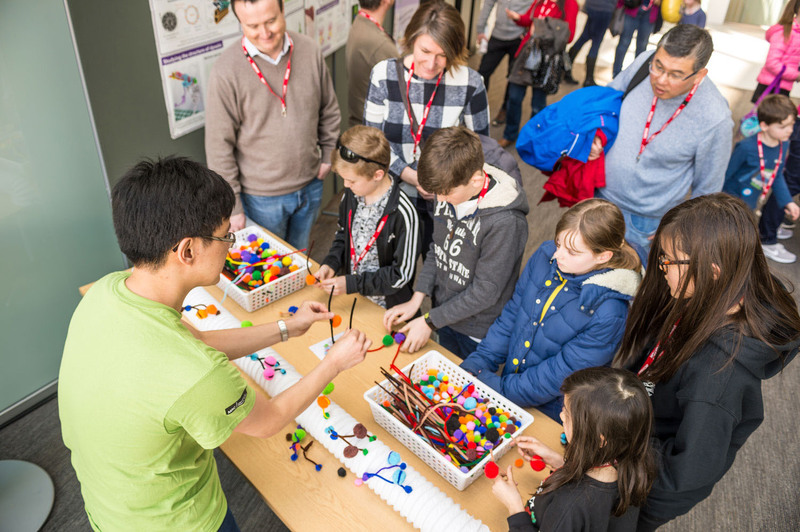 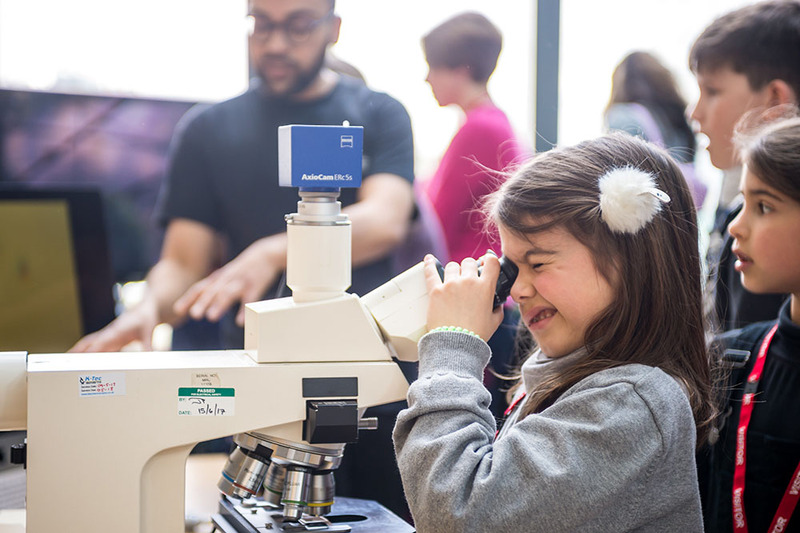 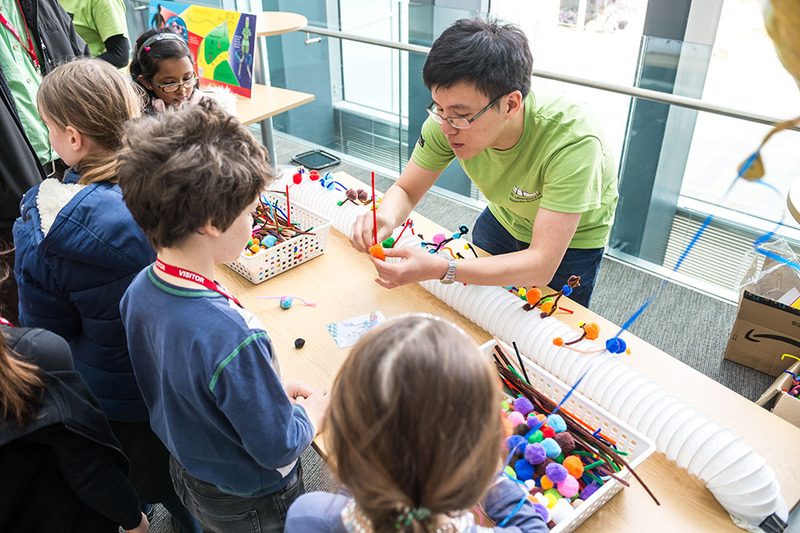 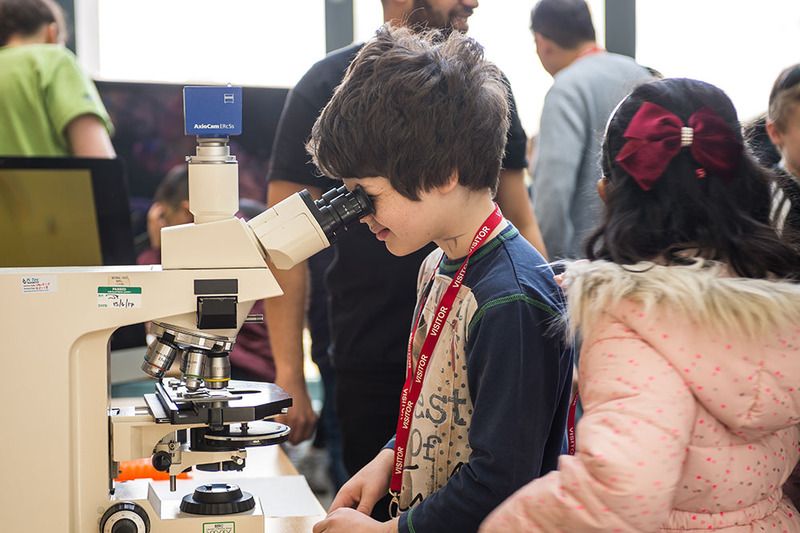 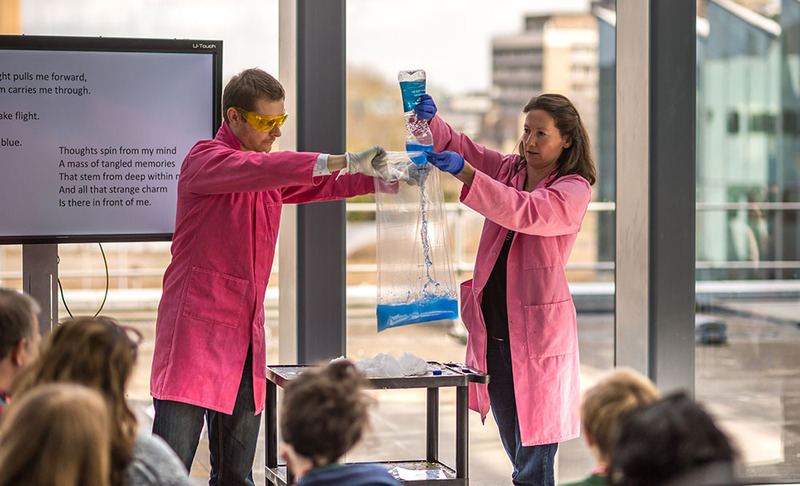 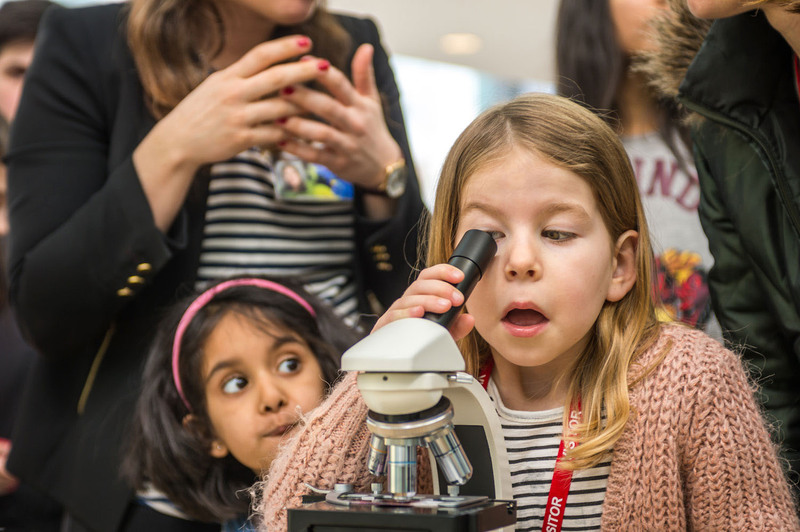 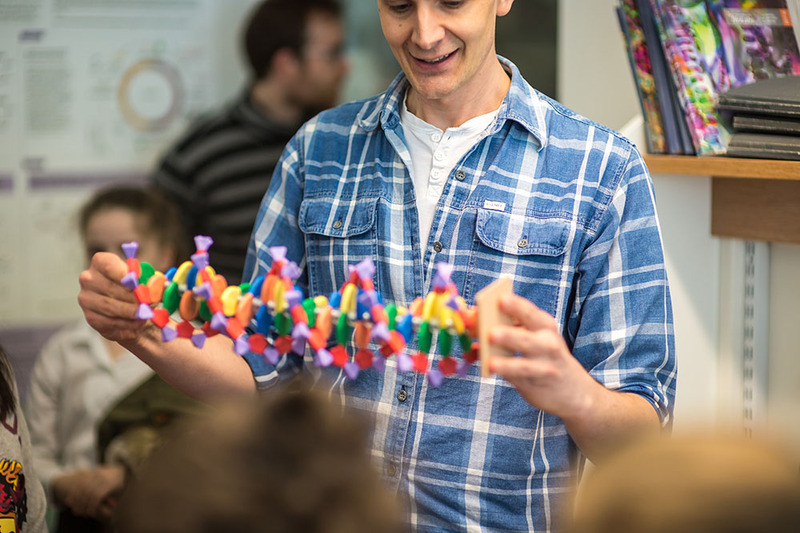 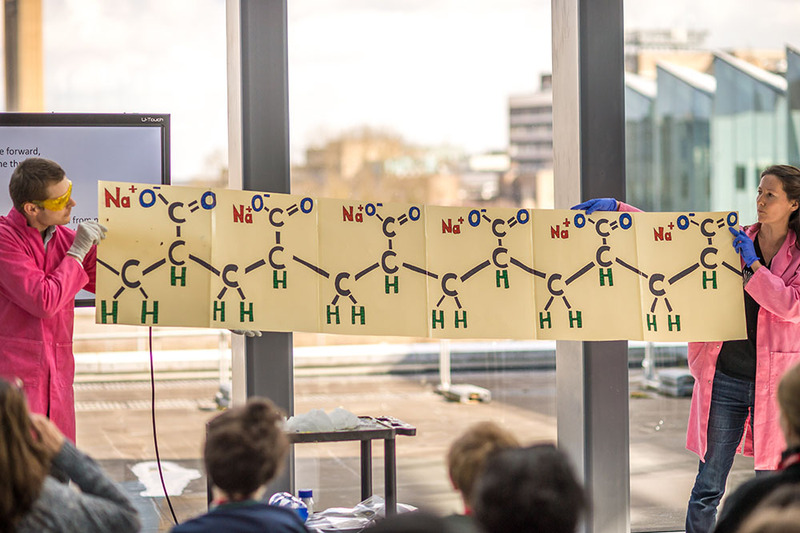 LMB scientists showcased their research and the excitement of science with a family-friendly hands-on activity, a fascinating talk and a music-meets-science event at the LMB – all part of the 2018 Cambridge Science Festival. 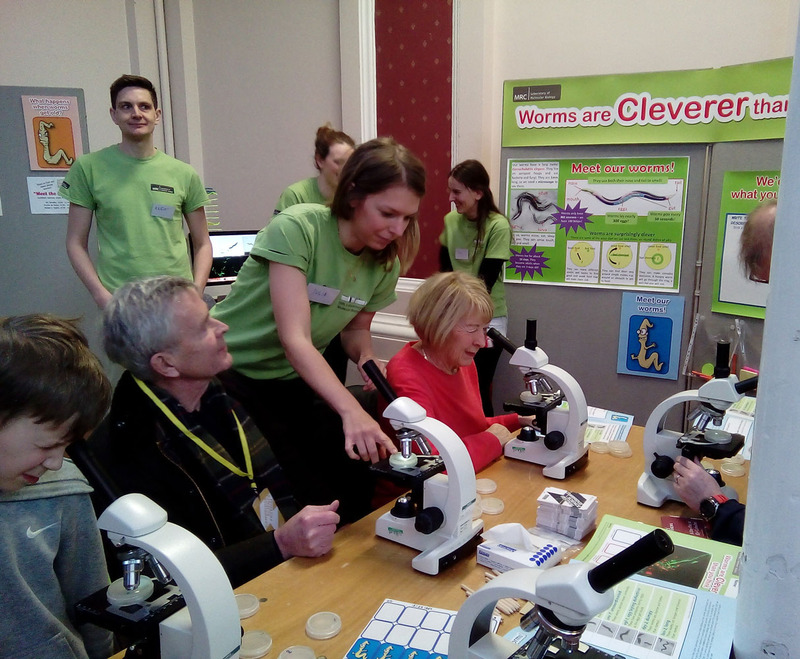 The first weekend of the Festival saw Denise Walker and her team of volunteers take the hands-on activity ‘Worms are cleverer than you think’ to the Guildhall. Over three hundred children and their families took part in the activity which included looking at live nematode worms (C. elegans) under the microscope, playing the mutant matching game, learning about how worms are used in research into aging and playing the sweet finding game to discover how worms use their senses to find food. 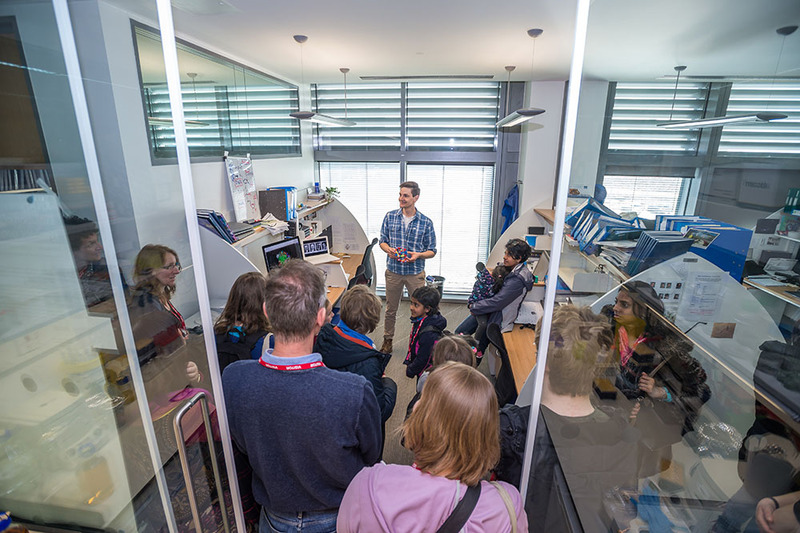 In addition, three LMB Group Leaders who work with C. elegans in their research, Bill Schafer, Mario de Bono and Rebecca Taylor, took part in ‘Meet the Scientist’. 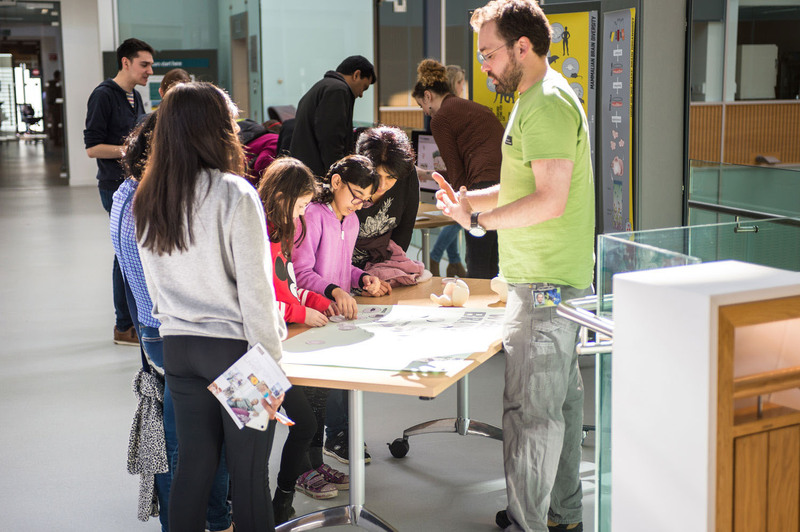 New for the 2018 Guildhall event, members of the public could pop into the special science booth to chat to the scientists about their research. 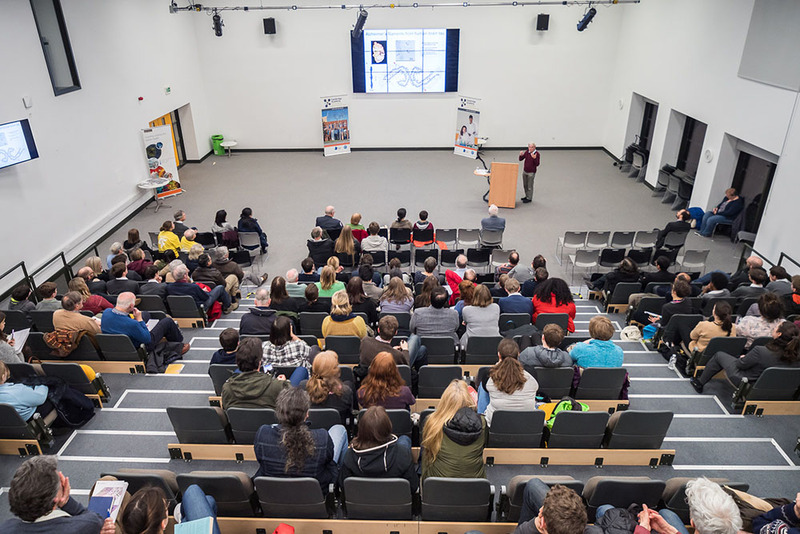 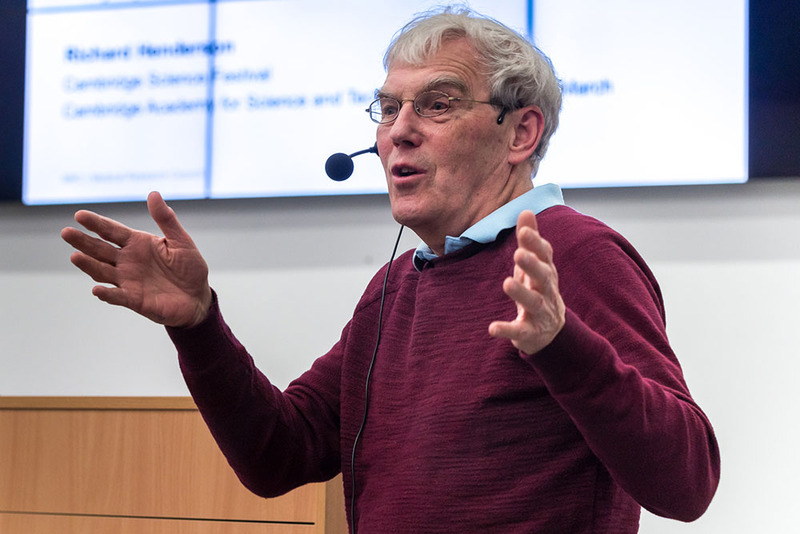 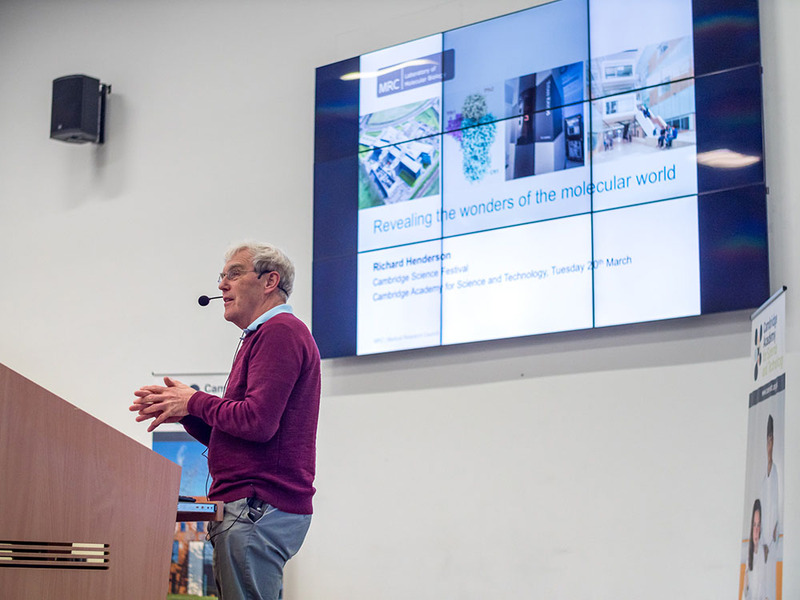 Richard Henderson entertained a large audience at the Cambridge Academy for Science and Technology (CamAST) on Tuesday 20th March. 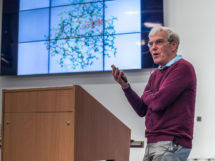 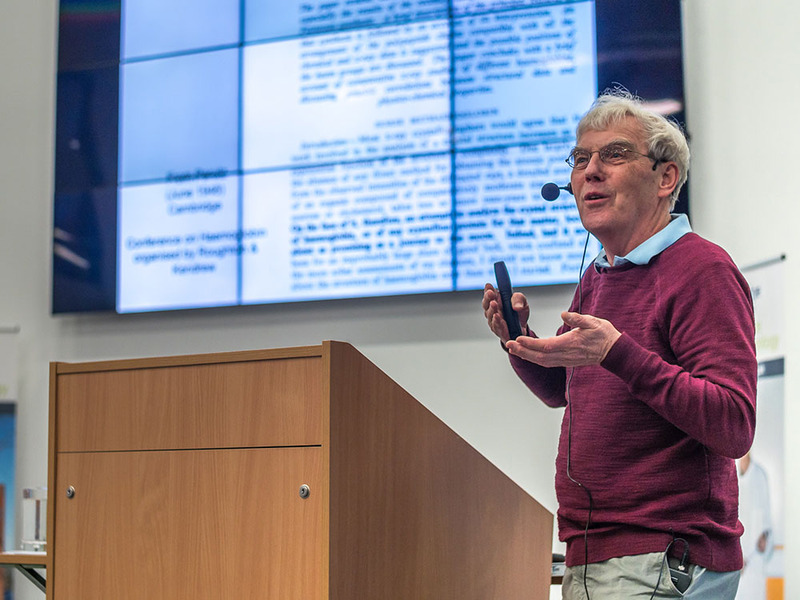 His talk looked at the exciting work in the field of structural biology, tracing the beginnings of the subject from the early 20th Century to the development of powerful new methods, including electron cryo-microscopy (cryo-EM), for which he was awarded the Nobel Prize for Chemistry 2017. 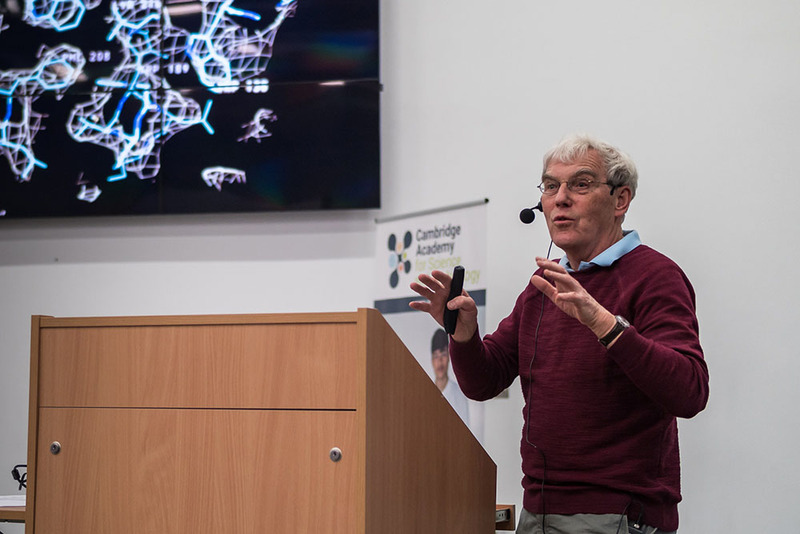 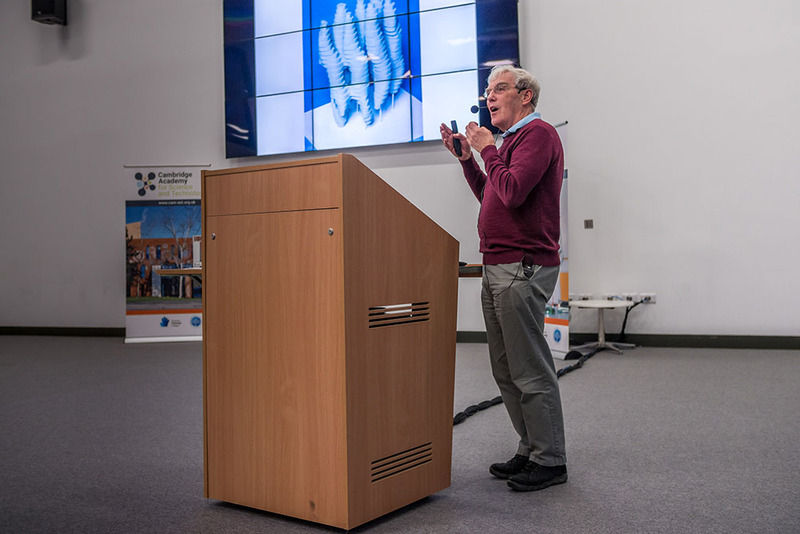 Richard explained how in the early days the task of trying to find the structures of biological molecules seemed impossible, like trying to journey to the moon. 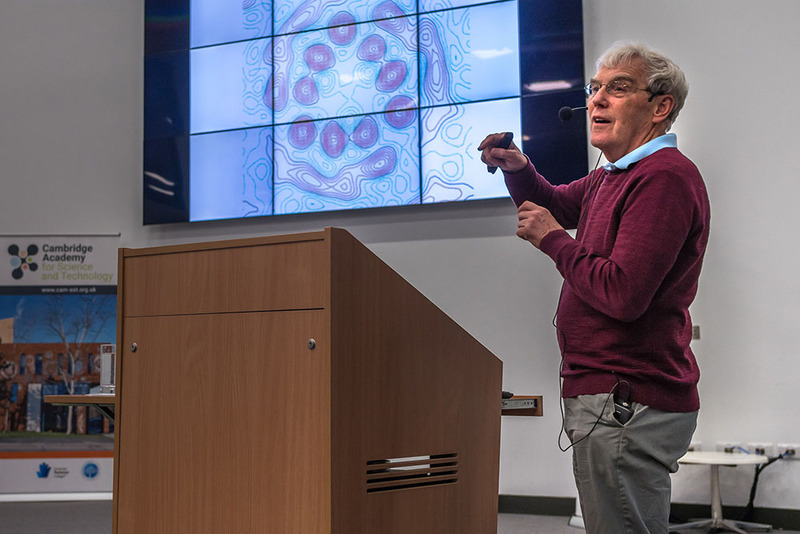 He showed how the increasing development of new methods began to reveal structures never seen before and highlighted the key role the LMB had in the development of these methods, including improvements in sample preparation, image processing software and image detectors, that resulted in the revealing of the first atomic structure. 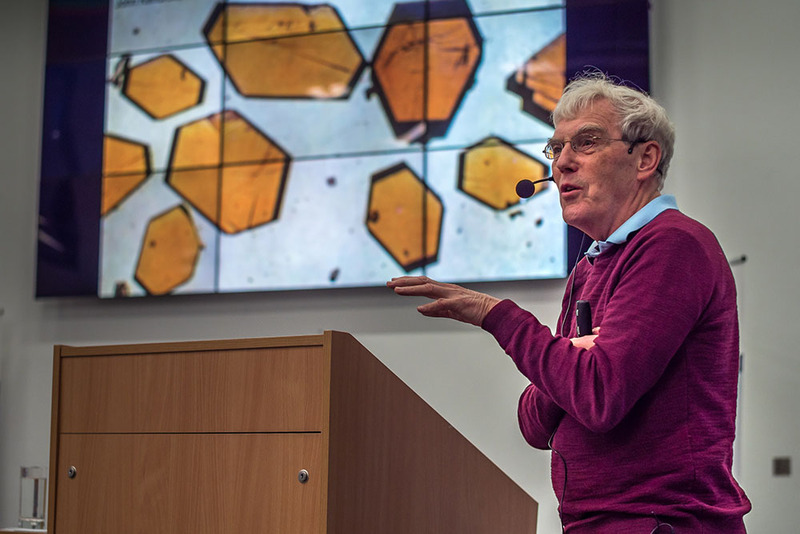 He predicted that in the next few years we would know the structures of pretty much everything and have a ‘periodic table’ of structures. This work, Richard explained, would aid the development of therapeutics, as nearly all the drug target areas would be determined, and through this structural biologists would help refine drugs. 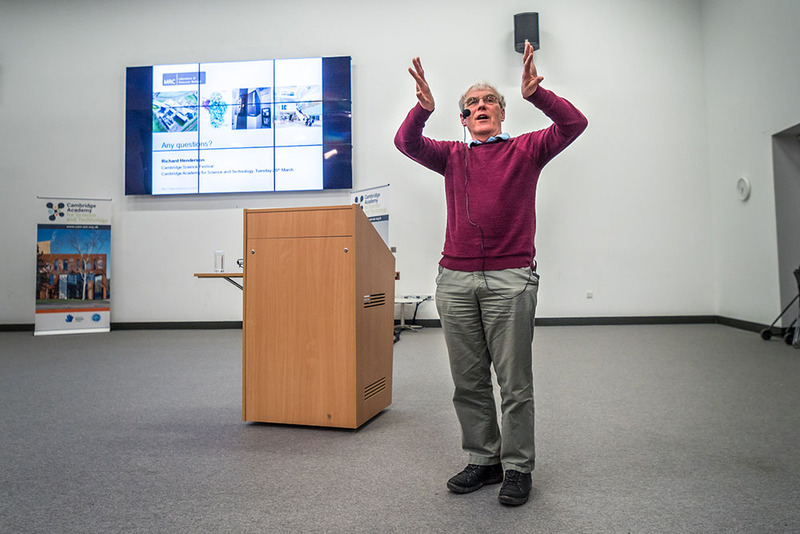 Richard answered a number of questions from the audience and was asked to offer his advice to those looking to start a career in science. 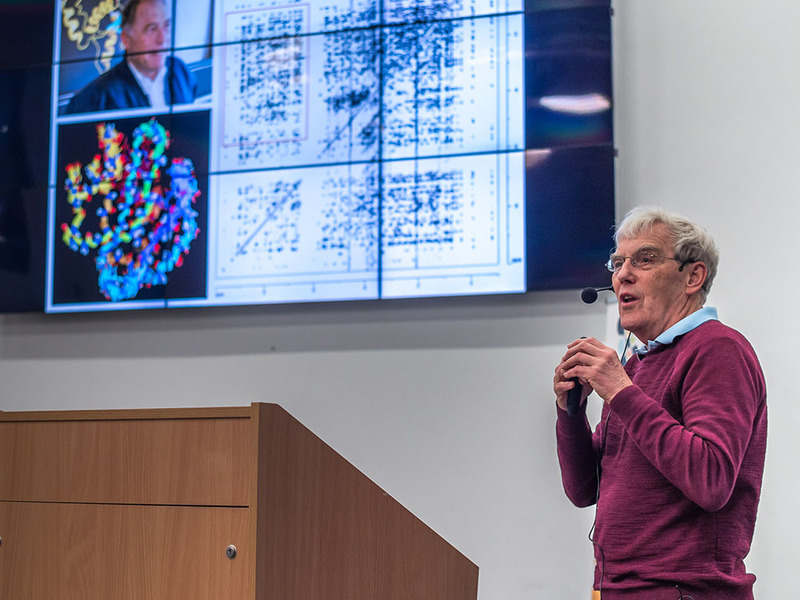 He replied, that there are many exciting things to do and that you needed to be really keen, need to enjoy doing the science and be really motivated to do it as the motivation will get you through the difficult times: if it is not difficult, it is not interesting. 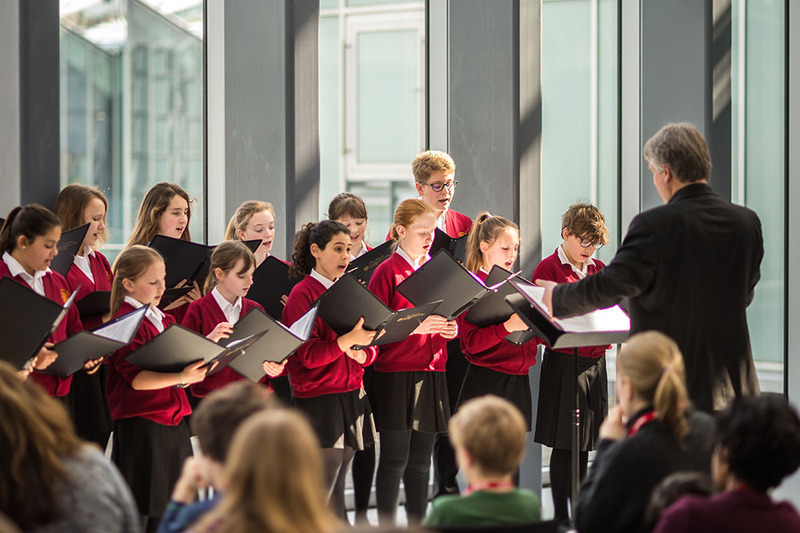 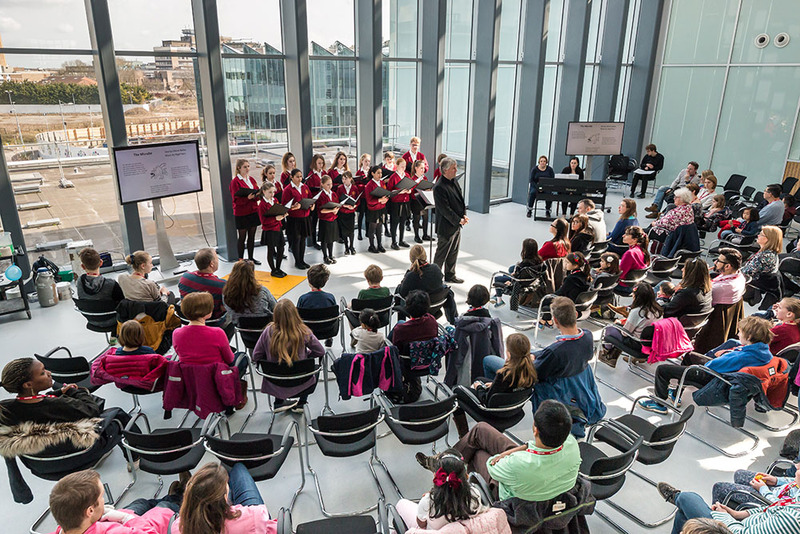 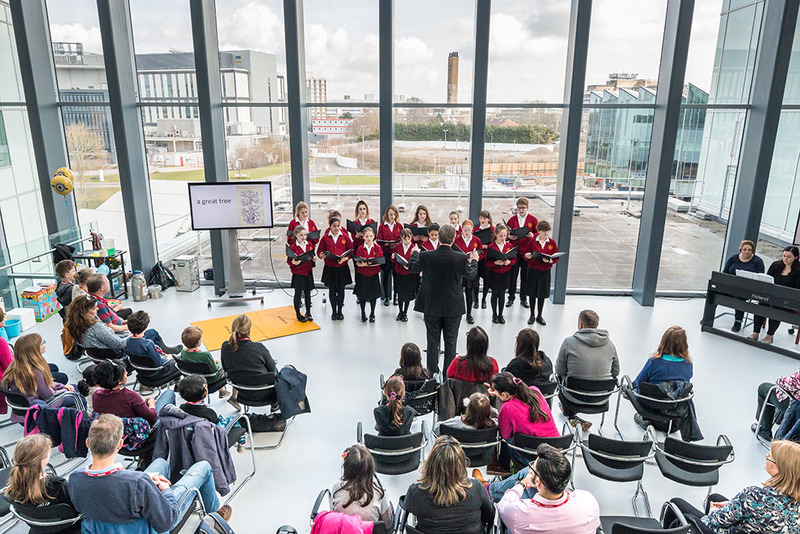 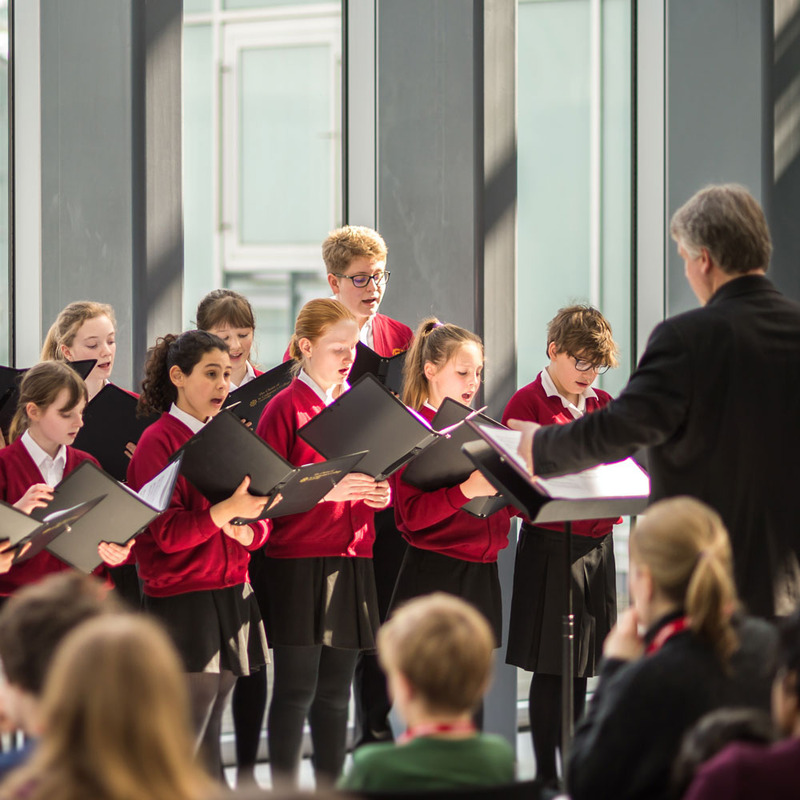 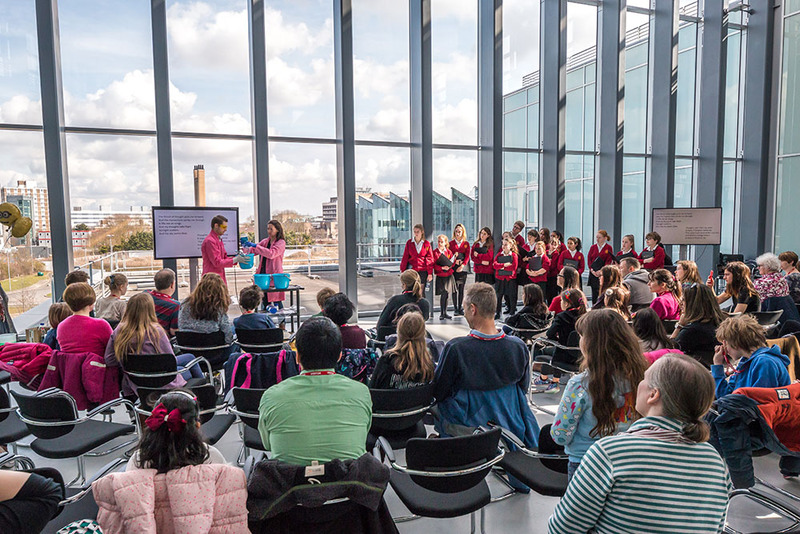 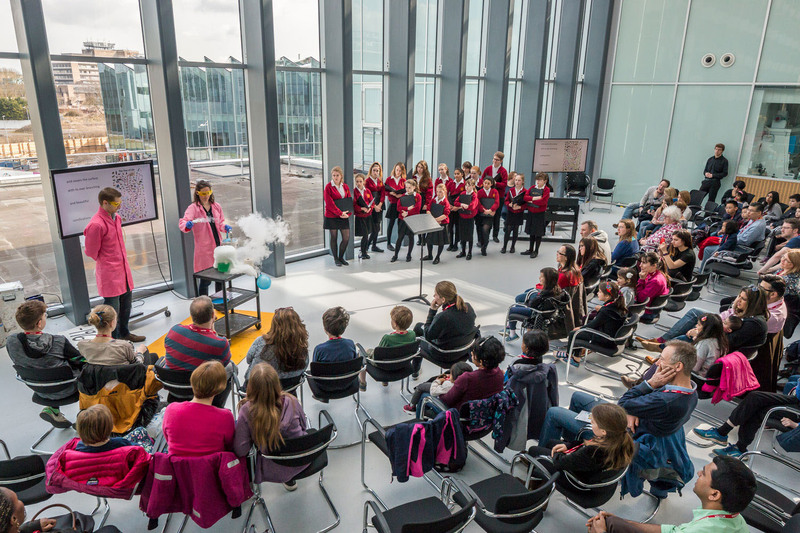 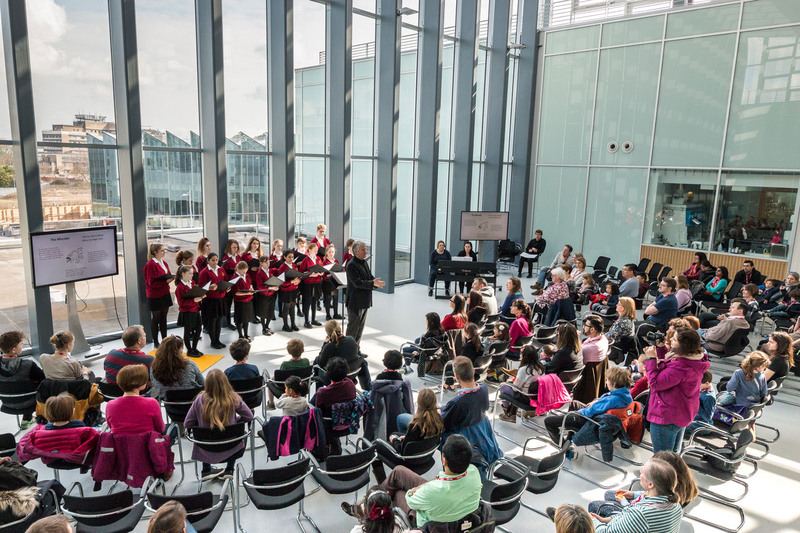 The LMB atrium was filled with music during STEM in Song as the Girls’ Choir of St Catharine’s College performed songs featuring microbes, the scientific pioneer Margaret Cavendish and the chemical for DDT. 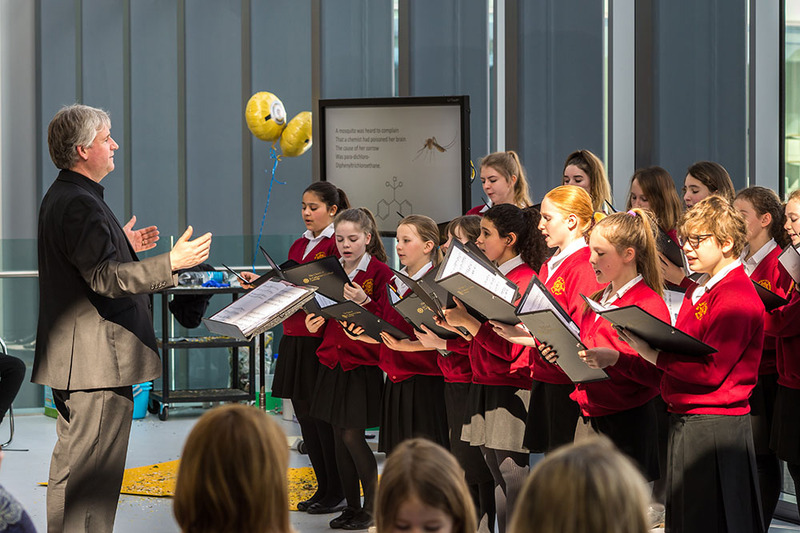 The highlight of the show was the premiere of ‘There in Front of Me’, the winning poem from the STEM in Song competition set to music by the choir’s composer, Gwyneth Herbert. The poem’s author, Isabella Bridge, was present during the event, and read her poem to the audience before the song’s premiere. 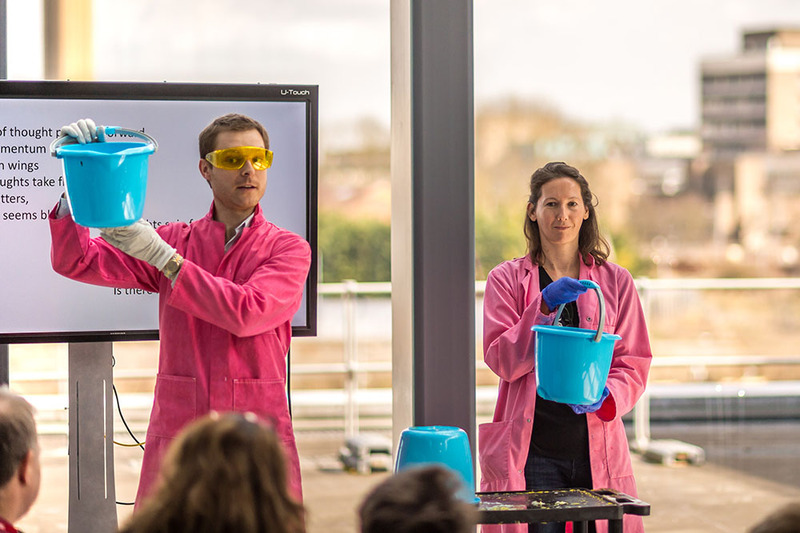 The music was interspersed with entertaining scientific demonstrations by Dr Mairi Kilkenny and Dr Neil Rzechorzek from the University of Cambridge Biochemistry Department. 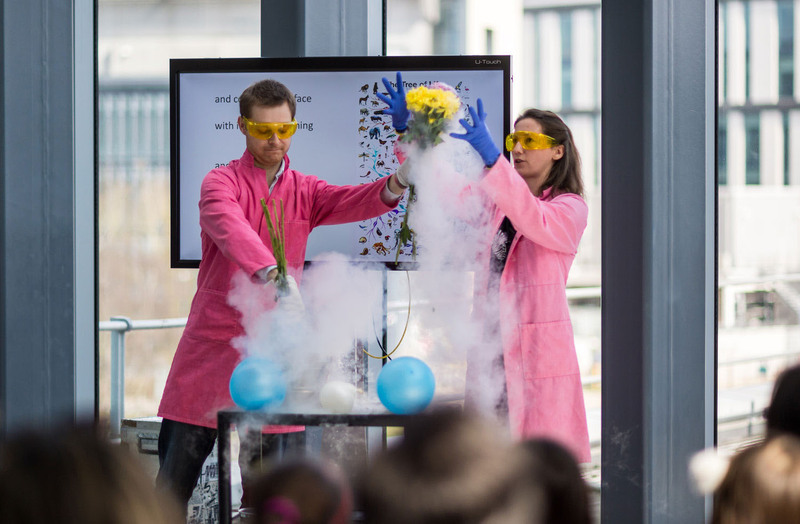 They wowed the audience with a disappearing water trick and flowers that shattered after rapid freezing in liquid nitrogen. 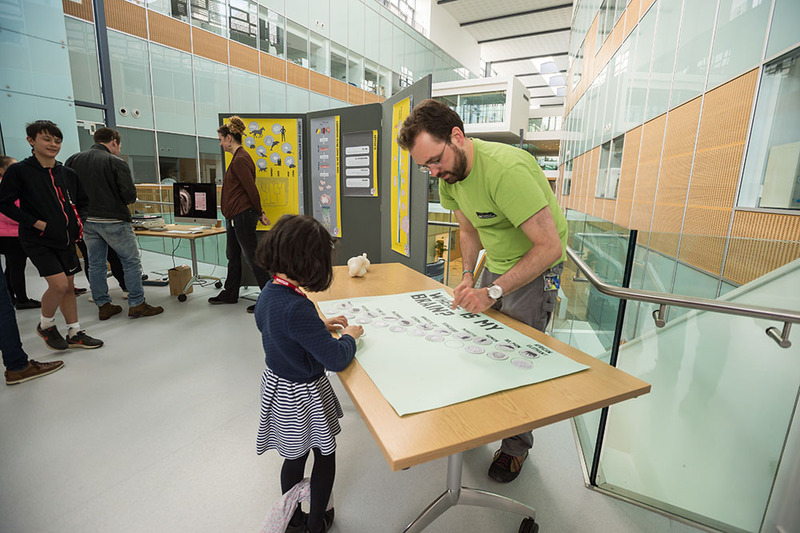 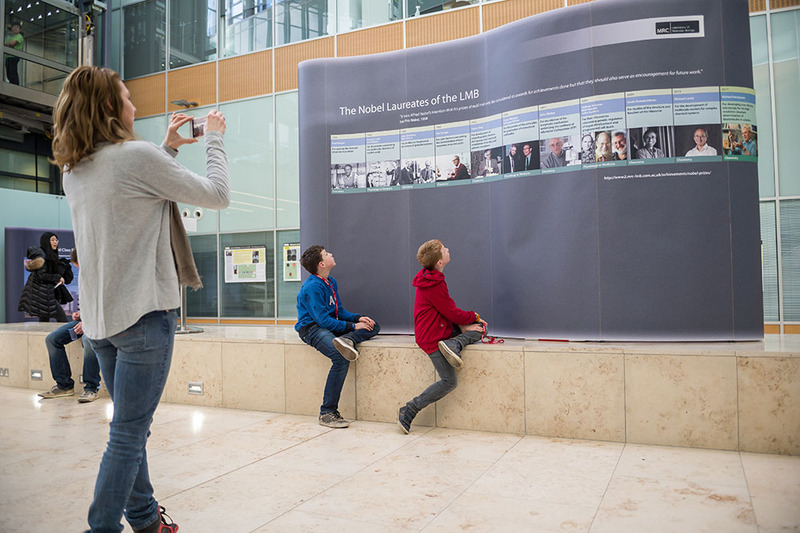 Following the performance, visitors learned more about the cutting-edge research taking place at the LMB. 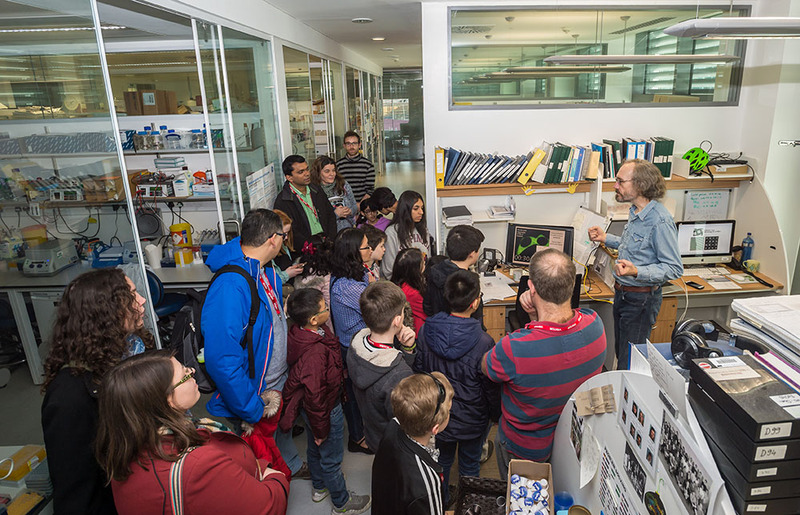 During laboratory tours LMB scientists introduced their work on signalling pathways in cancer and the chemical origin of life. 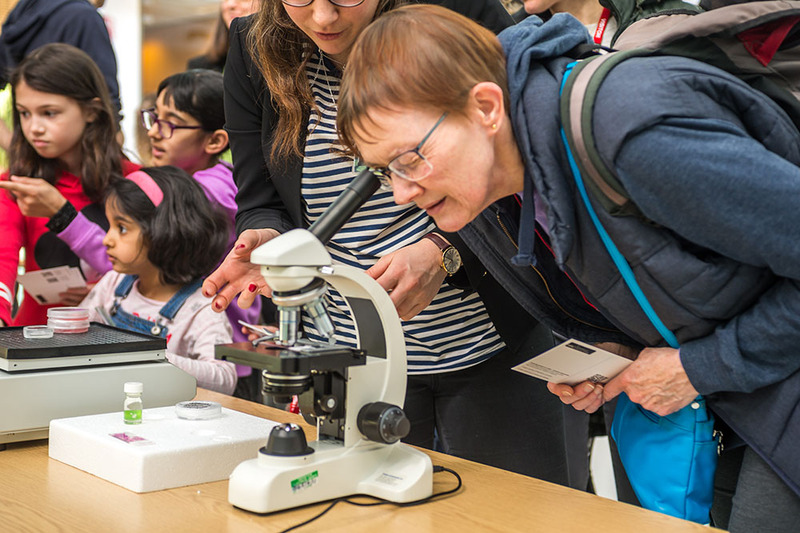 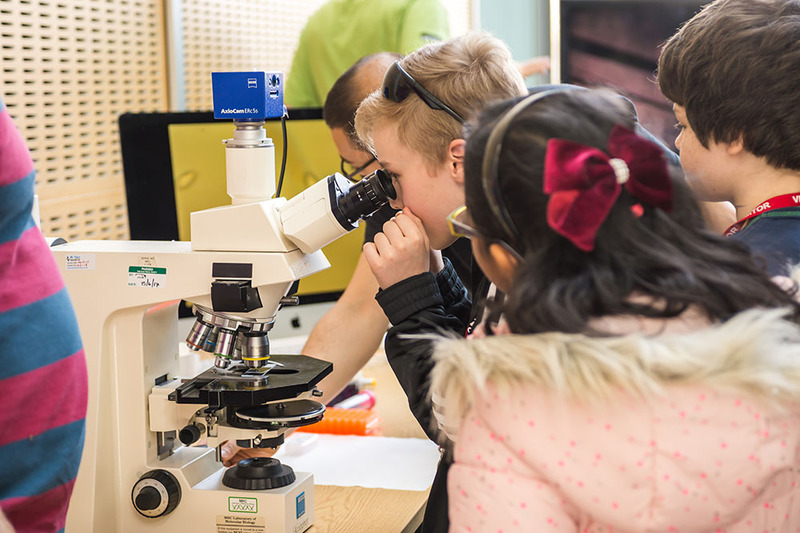 There was also chance to meet researchers at two family-friendly hands-on exhibits: ‘Mighty Molecular Motors’ and ‘From mini-brains in a dish to big brains in our heads’. 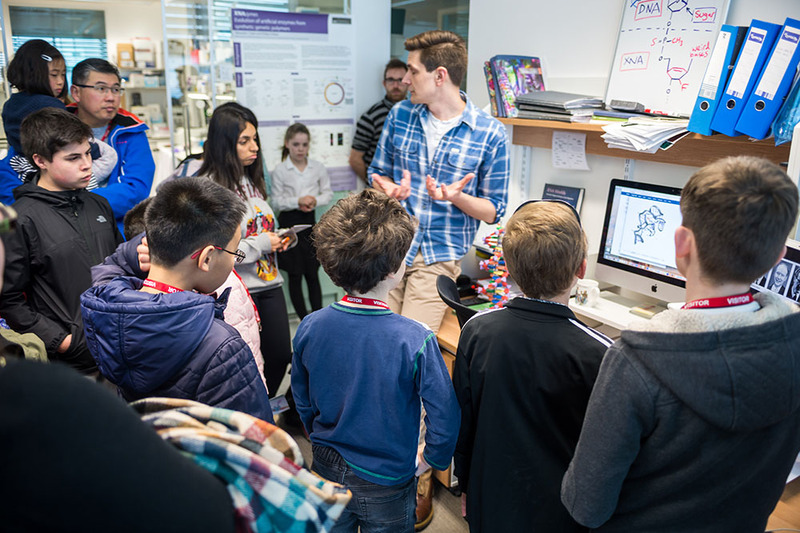 Visitors discovered the tiny machines that organise the inside of our cells by making pompom and pipe cleaner models of the molecular motor, dynein, viewing Tetrahymena cilia in-action and rotating 3D molecular structures. 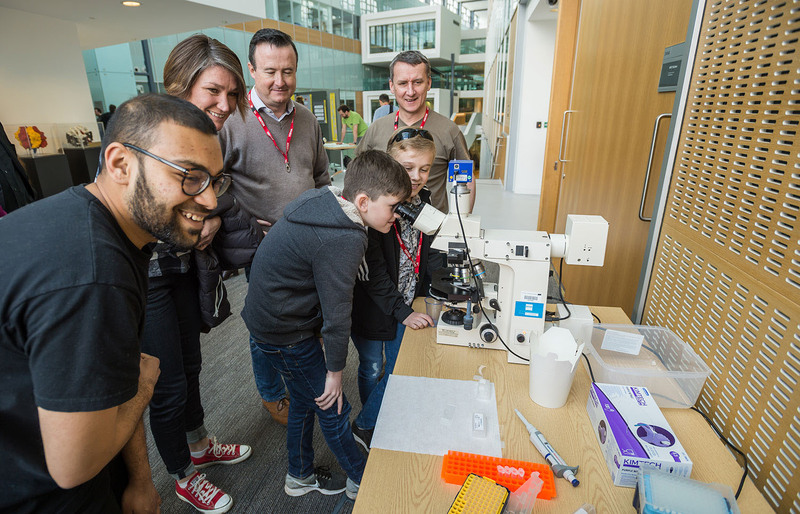 Visitors could view ‘mini-brains’ in a dish and find out how these brain organoids are used to study brain development, and then test their matching skills in the ‘Where is my brain?’ game.